3 1/2 tbsp unsweetened or sugar free raspberry or strawberry jam or for primal use homemade jam, homemade jam recipe here. Add to large mixing bowl: 2 (8 ounce) packages cream cheese softened, 1 tbsp lemon juice, 1 tsp lemon extract, ½ tsp vanilla extract. Beat with electric mixer on medium for about a couple minutes or until creamy and mixed. Set aside. In a medium size glass or ceramic mixing bowl combine: ½ cup sweetener of choice and 1 envelope gelatin. Stir together. Bring water to a boil in a pan or a tea pot. Pour a ¾ cup of boiling water into a glass measuring cup. Add ¾ cup boiling water to sweetener and gelatin mixture and stir thoroughly. Slowly add a little of the water gelatin mixture at a time to the cream cheese mixture and beat in with electric mixer on medium. Continue to add more and mix in. Spoon equal amounts of mixture into 12 silicone muffin cups that are lining a muffin pan, or spoon all of mixture into a greased spring form pan. 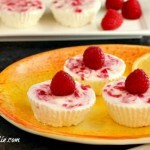 Refrigerate for 3 hours, then freeze for 20 to 30 minutes (this helps for easier removal of the cheesecake bites from the cups) * don’t leave in freezer longer as you don’t want them frozen. Remove from silicone cups by slowly peeling back the baking cups until the baking cup is inside out. If using a spring form pan, then just remove the outer pan sides and slice and serve. Store unused portions in the fridge, and can always freeze a little before serving again.